His heart was filled with intense love for all human beings irrespective of caste, creed, or color. His mission was to bring people abreast of the reality that all men and women, although inhabiting different regions of the world, and seemingly different from one another as regards their color, language, dress, culture, etc., were each other’s blood brothers. Hence a proper relationship will be established between all human beings only if they regard one another as sisters and brothers. Only then will proper feelings of love and respect prevail throughout the world. Part of his excellence is that Allah gave him two of His names, saying: "merciful, compassionate to the believers." There is also the tradition about the night prayer and the one forbidding them to fast continuously and the one about his dislike of entering the Ka'ba lest it became incumbent on his community and his desire that his Lord should make his curse against them a mercy to them. When he heard a child weeping, he would shorten the prayer. 'A'isha said, "The Messenger of Allah, may Allah bless him and grant him peace, was never given a choice between two things but that he chose the easier of the two." One day, the prophet saw Umair crying and asked him how is Al-Nughiar, so the boy said, Al-Nughair died, O prophet of Allah. With that, Prophet Muhammad, peace be upon him, stopped to console the boy and to try to cheer him up. That was how our prophet was, kind, caring and merciful. I admit. I'm at a loss. Is it really possible to specify just one reason why I love the Prophet Muhammad? Sitting down to write these words, thoughts crowd my mind. I love the Prophet because… he taught us about Islam, he was such a good human being, the many actions he did or words he said that continue to touch my heart, no matter how often I read about or reflect on them, and on, and on, and on. Finally, one thought manages to stand out, not because it was the loudest, but because it was the softest. I love the Prophet Muhammad because of his gentle, loving nature. Despite his position as a prophet and leader of the Muslims, he had time to sit and console a young boy whose pet bird died. He had time to joke with and love his wives. He had time to mourn the deaths of several of his children. As a spiritual leader whose main mission in life was to help others make choices for the Afterlife, and as a prophet who was in continuous connection with his Creator and the Angel Gabriel, he (peace and blessings be upon him) never lost his humanity. "Great was the sorrow in the City of Light, as Medina is now called. The Companions rebuked each other for weeping, but wept themselves. “Not for him do I weep,” said Umm Ayman, when questioned about her tears. “Know I not that he hath gone to that which is better for him than this world? But I weep for the tidings of Heaven which have been cut off from us.” It was indeed as if a great door had been closed. Yet they remembered that he had said: “What have I to do with this world? I and this world are as a rider and a tree beneath which he taketh shelter. Then he goeth on his way, and leaveth it behind him.” He had said this that they, each one of them, might say it of themselves; and if the door had now closed, it would be open for the faithful at death. They still had in their ears the sound of his saying: “I go before you, and I am your witness. Your tryst with me is at the Pool.” Having delievered this message in this world, he had gone to fulfil it in the Hereafter, where he would continue to be, for them and for others, but withouth the limitations of life on earth, the Key of Mercy, the Key of Paradise, the Spirit of Truth, and the Happiness of God." The passage above is taken from Martin Lings’ Muhammad, and refers to the aftermath of the death of the Prophet, peace be upon him. who think they are sane and saviors, but who shrink from the light of day? when oceans of plastic silence fill our ears with their deafening din? when the very foundations of trust have been laughed into mud and ruin? when our own streets are hallucinations like savage animals trapped? when most of them are full of sickness and most of them want to die? the dumb are leading the eloquent, the leaders are fearful of insight! begin to glimpse this other world with its other moon and sun? who’d rather sit in a stupor and worship bits of wood or stone? how to face absolute Oneness without losing balance from fright. when their drunken hearts drink darkness sold at the tyrant’s corner booth? and such mention of life only bores the snoring multitudes of the dead? we are naked before Allah at last, and we need your enlightening sun! Why did the Companions Love the Prophet so Much? Aishah reported that a man came to the Messenger of Allah (peace be upon him) and said: "O Messenger of Allah! Indeed, I love you more than I love myself, and I love you more than I love my family, and I love you more than I love my children. When I am at home and I think of you, I am unable to contain myself until I can come to you and look at you. When I think about my death and your death, I know that when you enter Paradise, you will be raised to where the Prophets are. But, if I enter Paradise, I am afraid: will I be able to see you?" "Indeed, he loves Allah & His Messenger…"
This man named `Abd Allah so loved the Prophet (peace be upon him) that he used to delight in presenting the Prophet with any delicacy that came to Medina, so when any merchant caravan arrived with something like butter or honey, he would take it for him as a gift. Later, when the seller demanded payment, `Abd Allah would bring the seller to the Prophet and say: "Give this man its price." The Prophet (peace be upon him) would then say: "Didn't you give it to me as a gift?" `Abd Allah would say: "Yes, O Messenger of Allah; however I cannot afford to pay." The two of them would laugh together and then the Prophet (peace be upon him) would have the merchant paid. This was the type of close and jovial relationship that `Abd Allah and the Prophet had with each other. It remains to be said that `Abdullah was an alcoholic. He would often become so drunk that he had to be brought staggering through the streets before the Prophet (peace be upon him) to be sentenced for public drunkenness, and each time, the Prophet would rule to have the prescribed punishment carried out. This was a common occurrence. After `Abd Allah had departed from one of these all too frequent sentencings, one of the Companion's declared about `Abd Allah: "O Allah curse him! How often he is summoned for this!" The Prophet (peace be upon him): rebuked that Companion, saying: "Do not curse him, for I swear by Allah, if you only knew just how very much indeed he loves Allah and His Messenger." [Sahîh al-Bukhârî (6282)] He then added: "Do not help Satan against your brother." We can learn a lot from the Prophet's attitude. We should reflect first upon the close and affectionate relationship this Companion enjoyed with the Prophet (peace be upon him), in spite of this Companion's shameful fault. Though the Prophet (peace be upon him) was who he was, it did not prevent him from relating to `Abd Allah in a familiar manner, of being his friend, and joking with him. This shows us that in the society envisioned by the Prophet (peace be upon him) people were not segregated into the pious and the sinners, with social interactions debarred between the two groups. Rather, it was a unified, inclusive society, where each person could be at a different level of piety. Some were at the forefront of righteousness, some were moderately pious, while others were prone to fall into sin. However, no one lived aloof from society, nor was anyone shunned. Everyone remained part of society. This inclusiveness meant that when some members of society fell into error, the effects of their mistakes were limited and short-lived. No one was marginalized, so there was no chance sinfulness to grow on society's "fringes". When anyone made a mistake, there was no end of brotherly support from others in society who were more than willing to lend a helping hand and get that person back on track. Another lesson the Prophet's conduct shows us is the importance of maintaining a positive outlook. In spite of the fact that `Abd Allah was frequently being summoned before the Prophet (peace be upon him) for public drunkenness, the Prophet drew everyone's attention to one of Abd Allah's positive qualities – that he loved Allah and His Messenger. Yet, when we think about this particular quality, we find that it was not something unique for `Abd Allah, but a quality that all believers have in common. Nevertheless, the Prophet (peace be upon him) chose to praise `Abd Allah for this reason. In doing so, the Prophet could cultivate, encourage, and strengthen this quality in everyone. He also reminded them that if someone slips up, that person's faith and love of Allah is still intact. We can imagine how `Abd Allah must have felt when he learned that the Prophet (peace be upon him) said this about him. He must certainly felt it as an immense honor to have Allah's Messenger declare this about him. It served to help him overcome his bad habit and gave him hope, by confirming that his essential being was not permanently marred by the mistakes. It was the Prophet's way to point out the good qualities of those who sinned and fell into error. We sometimes forget this, and treat past sins as impenetrable barriers to future good. A person who commits a shameful deed is never allowed to live it down, but is instead often remembered only for that sin. We need to realize that this helps Satan to avail upon the sinner and get that person to sin again. The Prophet's approach, by contrast, inspires virtue. When reminded of `Abd Allah's frequent drunkenness, he boasted of that man's possessing the greatest virtue of loving Allah and His Messenger. Finally, `Abd Allah had done something that was clearly wrong. There can be no doubt that `Abd Allah committed a sin. Imbibing intoxicants is a major sin, and the Prophet (peace be upon him) had often cursed wine. Nevertheless, after the Prophet had the prescribed sentence carried out upon `Abd Allah for his public drunkenness, he did not seek anything further against him. He saw any further reprimand to be helping Satan against the man. Rather, he turned everyone's attention to his merits that compensate for his shortcomings. This should give us pause, when we consider how harshly we sometimes behave in our disagreements with others whose transgressions are far less serious or certain than `Abd Allah's were. Sometimes, it is merely our opinion that someone has done something wrong and the matter is really open to other points of view, but we still have no hesitations about railing against our opponents with everything in our verbal arsenal. How far this is from the example set by the Prophet (peace be upon him), who when faced with a person committing an obvious sin, still found it better to speak good about that person. He still kept up his good relationship with that person, despite his shortcomings. The Prophet's conduct with `Abd Allah is an excellent example for us, full of valuable lessons regarding not only how we should treat one another, but how society can foster social bonds that are strong, wholesome, and nurturing, bonds which can serve to dissuade people from falling into sin. During the early years in Makkah, most members of the small community of Muslims were oppressed, especially the poor and those who had no tribe or family members to protect them. Some of them were tortured, like Bilal and Suhaib, to make them leave their religion, but they were patient and their strong faith made them resist all those pressures and injustices. As time went past, the pressure of the disbelievers in Makkah grew stronger, and though the prophet, peace be upon him, asked his followers to be patient, he was very sad for what they were going through. He needed them with him, but at the same time he was concerned for their safety, so one day he asked some of them to leave Makkah and emigrate to Al-Habasha (Ethiopia). Prophet Muhammad (peace and blessings be upon him) had a profound love for humanity. Throughout centuries, Muslims have had a deep, passionate love for him. The love harbored in the hearts of Muslims remains a source of inspiration, a factor of unity, and a leveler of differences among them. Indeed, this love is based on the love of Almighty Allah and on the supreme message of Islam. 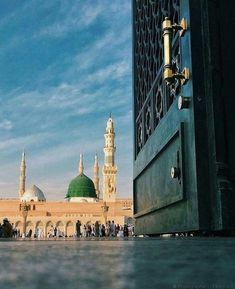 'Amr Ibn Al-'Aas said, "There wasn't anyone more beloved to me than the messenger of Allah - salah allahu 'alayhi wa salam - and more glorious in my eyes than he. I wouldn't allow my eyes to stare at him so that to honor him, and if you were to ask me to describe him, I couldn't..."
On another occasion, a funeral procession passed by. On seeing this, the Prophet stood up. One of his Companions remarked that the funeral was a Jew's. Upon that, the Prophet replied, "Was he not a human being?" (Al-Bukhari). The Prophet (s.a.a.w.) enjoined upon Muslims to treat the poor kindly and to help them with alms, Zakat, and in other ways. He said: "He is not a perfect Muslim who eats his fill and lets his neighbor go hungry." Monopoly is unlawful in Islam and he preached that "It is difficult for a man laden with riches to climb the steep path that leads to bliss." "To give the laborer his wages before his perspiration dried up." "Allah is gracious to him who earns his living by his own labour, and that if a man begs to increase his property, Allah will diminish it and whoever has food for the day, it is prohibited for him to beg." "This man was ignorant, you should have dispelled his ignorance; he was hungry, you should have fed him." He stated, "Verily, there is heavenly reward for every act of kindness done to a living animal." Muhammad (pbuh) also used to command mercy for all animals such that they are fed well, watered well, not forced to carry too heavy a burden, and not tortured or maimed for one's enjoyment. "Allah's Messenger (pbuh) said: 'A woman was punished because of a cat. She neither provided it with food nor drink, nor set it free so that it might eat the insects of the earth.' " (Narrated by Muslim and Al-Bukhari). Prophet Muhammad (peace and blessings of Allah be upon him) was always cheerful, genial, and pleasant-tempered. He was never rude or rough.